If you're like many women, swollen feet can make your pre-pregnancy shoes tight and uncomfortable. However, you don't have to switch to clunky orthopedic shoes or sacrifice comfort for style. There are plenty of fashionable options out there that provide the flexibility and support you need during this important time in your life. According to Parenting Magazine, the average woman sees her feet grow by about half a size during the nine months she's pregnant. Like so many other pregnancy symptoms, this change is due to hormones. As your joints become looser, the small bones in your feet can spread, leading to longer and wider feet. In addition, pregnancy swelling caused by fluid retention can make your shoes feel even tighter. Luckily, there are plenty of options to help. Although they may not offer a lot of arch or ankle support, ballet flats are ideal for feet that are swelling. What's more, they are cute and go with just about any outfit. You can purchase metallic flats for dressy events and fun colors to accent your skinny jeans, capri pants, and dresses. If you're pregnant and buying flats, be sure to try them on and walk around a bit. Look for flats made out of fabric or very soft leather that will conform to the new size and shape of your foot. ShoeTherapy Blushing Ballerinas are a soothing choice. They have ergonomic soles and stretch sides. The company even claims these shoes boost circulation. B.O.C, by Born Concept Beale Flats are another style to consider. These shoes are designed with comfort in mind, but they're also cute and stylish. Most feature arch support and a padded footbed, rare in ballet flats. Easy Spirit Yandra Ballet Flats have cushioned insoles and criss cross elastic straps that will stretch when the tops of your feet begin to swell. Choose from four colors. Perfect for fall and winter weather, boots offer an instant upgrade for any maternity ensemble. What many people don't realize from looking at them is that boots are extremely comfortable too. They offer ankle support, which keeps your pregnant feet from getting jammed into the toe of the boot. The ankle support also allows you to order a half size larger and not feel like they are too big. When shopping for boots, you'll need to try them on and make sure they aren't too tight in the calves and ankles; choose wider-calf options or boots with a little stretch to compensate for this issue. Also, stay away from boots with higher heels since your center of gravity is different during your pregnancy. 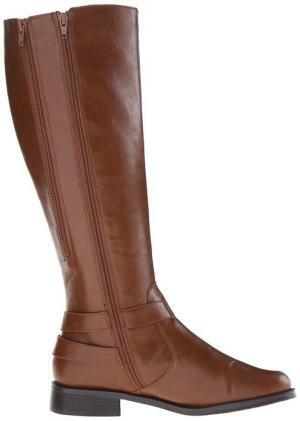 Aerosoles With Pride Riding Boots offer the kind of fit and style you need during pregnancy. They feature comfortable rubber soles and side-by-side zippers that allow you to adjust the calf width as needed. The toes of these boots are also rounded for more room. UGG® Cambridge Boots have an adjustable strap which you can even remove if you need to. The insides are lined with a comfortable wool lining. Ignore the manufacturer's recommendation and order the next size up if you usually wear a half size. This will give you the extra room you need if your feet begin to swell. You don't have to be participating in a sport or working out to wear athletic-style shoes. In fact, the rubber sole and extra support provided by these shoes make them perfect for pregnant feet. Although many athletic-style shoes have laces, which can provide a customized fit, it's far easier to wear slip-on shoes when you're in the third trimester. For the best of both worlds, chose shoes that have elastic laces or stretch panels. Skechers Sport Conversations Charming Fashion Sneakers are a perfect choice, and they're available in more than a dozen color combinations. These shoes feature a rubber sole with non-slip treads and elastic laces that you won't have to bend over to tie. Easy Spirit Quash Slip-On Sneakers are a great option too. Featuring memory foam and gel insoles and elastic panels, these stretchy athletic shoes are stylish and comfortable for swollen feet. Converse Chuck Taylor Slip Sneakers offer the cool look that comes with Converse without the hassle of the laces. These shoes feature a hidden elastic panel for a customized fit. If you're pregnant during the spring and summer months, you've got lots of options. Because of their open design, sandals allow your foot to swell without squeezing or pinching it. However, not all sandals are good for pregnant feet. Stick with flat options, rather than heels. Also, look for sandals that will stay securely fastened to your feet; flip-flops are a no-no. It's also nice to choose sandals that are easy to fasten, since bending over may be a challenge. Merrell Mimix Bay Sport Sandals have stretch fabric uppers, contoured foam cushion footbeds and air cushion heels. These casual sandals could be a perfect choice. Teva Women's Tirra Sandals have several hook and loop closures to give them a totally customized fit. The molded footbed offers lots of good support too. Shop after you've been on your feet for a while. As you stand or walk, your feet may swell, giving you a better sense of how the shoes will fit. Low, wide heels are better than kitten heels or pumps because they provide more stability. Whenever possible, choose slip-ons or easy fasteners rather than complicated laces or buckles. To find out your new size, visit a reputable shoe store for a proper fitting. This will help you determine if you need to go up a size or if you'd be better off with a wide-width shoe. If you have other foot problems like heel spurs, bunions, painful corns, or flat feet, you may find it best to speak with your podiatrist regarding what kind of shoes to purchase. Although swelling feet may seem like they put a damper on your sense of style that's really not the case. There are a lot of great options out there that will have you feeling stylish and comfortable throughout your pregnancy and beyond.